There was ice on the bird bath this morning and I mournfully put away all my paddling equipment. It hasn’t been used in the past couple of weeks, but I kept it out anyway, probably as a way to forestall the inevitable onset of another Michigan winter. 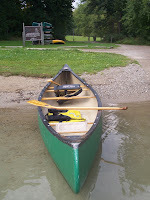 As I put away the paddles and other gear, I got to thinking, why do we paddle? If we just wanted to cross a body of water or fish, we’d use a motor boat, they’re faster and easier. But I think motor boats cut down on our horizons, while canoes/kayaks expand them. I’m attracted to the irony that paddling expands your world. That’s because it slow you down. Zipping quickly from place to place on a small lake uses up the scenery at a fast pace. When you’re paddling, the landscape gently unfolds and you notice the small bays and you don’t frighten the wildlife. There’s a small lake near my house that I paddle in late summer and early fall to catch a glimpse of sand hill cranes. They only nest in two places in Michigan, one in the Upper Peninsula and the other near my home in southern Michigan. A motor boat would send the cranes flying, but in my canoe, I can glide close enough to them so they can put on their gangly dance of a walk for me. Also, a canoe/kayak can easily be landed on a shoreline, where you can explore small wetlands or natural features. The horizon of the natural world gets larger, rather than contracts when paddling.